It happens every year. Time speeds up, the days fly by and before it could realistically be possible, we find ourselves in the grip of the holidays. It is totally ridiculous that Christmas Carols are playing throughout the malls and department stores the day after Halloween. It is even more ridiculous that in chain stores like Fred Meyer, Walgreen’s, Bartell’s, Walmart, K-mart, Target, and so many others you will find shelved side-by-side in mid-October both Halloween and Christmas decorations… What??? Yep, every year retailers across America thrust the Christmas season upon us just a little bit earlier. It used to be subtle and we weren’t really aware of it. But now… Oh’mgosh! Thanksgiving is still a week away and the U.S. Forest Service began issuing Christmas Tree-Cutting permits for our local forests six days ago (Nov 14) and as would of course follow, the Christmas tree lots are jumping in on the market, seven days before Thanksgiving themselves. The fast-forward button needs to stop. Big Business, you’re taking it too far! 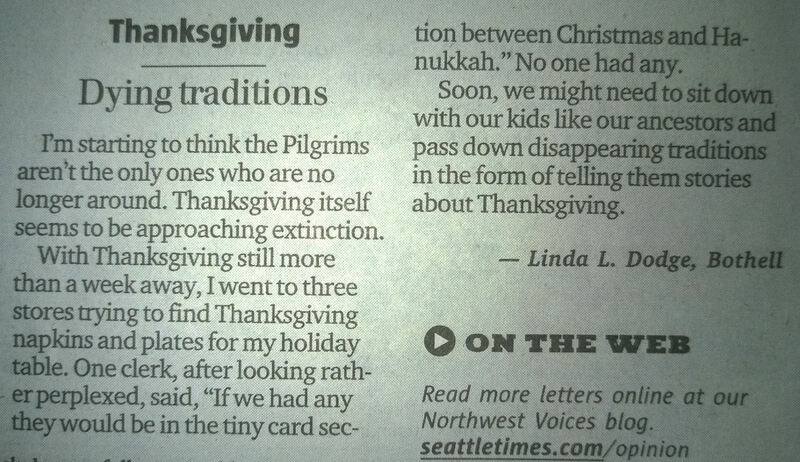 And here we are now, in the 21st Century, and I’ve got to ask: What about Thanksgiving? Where are the Thanksgiving decorations? 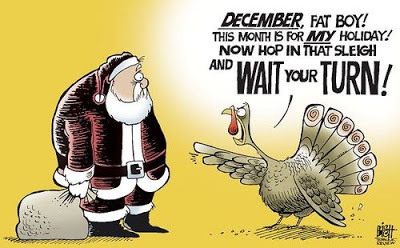 These corporations that dictate the world around us, they must simply be forgetting about Thanksgiving, right? They couldn’t really be trying to rub the holiday out as though it has no meaning whatsoever and has never existed. You might think I am arguing for Thanksgiving decorations to come back into the retail market, but I’m not. I simply think that Thanksgiving is a much more important holiday than Halloween (and it can be as much fun as you choose to make it). Perhaps corporate America does not understand its value because they’re too busy brainwashing us into throwing away our ethics, morals and values and handing over our hard-earned money for valueless possessions. I mean, think about it, when you die you cannot take that Sony Playstation with you, or that iPhone 6 (unless of course you were an Egyptian living 2000 years ago… but wait, they didn’t have the same technologies we do today so, even then you couldn’t take it with you). I wanted to take this Thanksgiving to say: Shame on all of you distributors, merchandisers, advertisers and retailers for turning a time set aside for giving thanks for the blessings of life, health, wealth, family, friends, and neighbors into a time when retail workers nationwide become enslaved to the masses as hoards of Americans abandon their families, and flock to the malls and shopping centers to spend billions of dollars in a period of 48 to 72 hours. Ever wonder why it is called Black Friday? You probably assume it has something to do with accounting or marketing. And maybe in part it does, but as far as marketing goes it should not have worked. Our brains naturally associate the color black with death and decay. If colors could have human attributes black* would be bad. And I mean like bad-bad-Leroy-Brown-the-Baddest-Man-in-the-whole-damn-town kinda bad. Taking it a step further, if you wiki search “Black Friday” you’ll discover there are twelve different days in history that are referred to as Black Friday, none of them about shopping and all of them were B-A-D, bad. Personally, I think Black Friday is appropriately named because the first 24 hours are of such ugliness where even the kindest and nicest people can be found scrambling from aisle to aisle, store to store, literally stepping on each other’s toes as they frantically climb over one another in an insane spree to ensure that they are one of the few in number that gets to watch as their son or daughter, spouse or lover on Christmas day open this prized gift. In the days following Thanksgiving and leading up to Christmas, these early-birdies are secretly fantasizing about the moment when, sitting around the Christmas tree, suddenly everyone in their world sees them as the most thoughtful, wonderful, loving, kind, superhero of a person the planet has ever seen. But in those preceding days there is no bragging, no gloating, no teasing. In those preceding days, the early-birdies play martyr to their spouses and perhaps even their children, reminding everyone that Christmas will be fantastic because “I sacrificed my Thanksgiving” to ensure that most-desired gift is among all of the unappreciated, unwanted and spur of the moment gifts we thoughtlessly purchased for our loved ones. Secretly the early-birdies know “I might not have gotten to share a glorious meal with my family and my plate of microwave-dried turkey and soggy mashed potatoes and spoonful of yams was less than exciting, but I am going to get something even better than Turkey dinner with all the fixin’s cooked to perfection. I will feel triumphant!” And so, really, it is no sacrifice at all. I mean, after all, the early-birdies get a few weeks of secretly relishing the anticipation of what it will feel like watching the children’s dreams come true and the husband’s eyes blossoming with the same awe and adoration that he always had in days long past. And so we cook and bake all day, we serve our family a grand feast, put on our coats, hats and shoes and walk out the front door without recognizing that in fact what we just gave up for that split second of awe, the self-proclaimed triumph and fleeting outside acceptance, admiration and love was the most cherished gift a person can give to another: Quality time together developing or reinforcing traditions and making memories that can span lifetimes. Why are we, as a nation, throwing out the virtue of appreciation, the humbleness of giving thanks to our spiritual or religious leaders, our friends and loved ones for the gifts and lessons they bring into our life each and every day, making our life a life worth living? Why must corporate America continue to squeeze two popular holidays so that eventually Thanksgiving and the values and lessons that come with it will be squeezed out of existence? I fear that eventually, this time of year will be referred to as Black Thursday or Black Friday or Black Week(end) and be relegated to the classification of “shopper’s holiday.” I mean, have you actually stopped to think about it? I just looked it up, 24 of our 50 states grant their government employees Black Friday as a public holiday. I don’t even get that day off. Anyone who works retail is forced to work Thanksgiving, on Black Friday, on Christmas… standing behind counters, providing customer service to make big money for Big Business while the rest of us are deprived of our families. Please, truly think about what is happening here. Our great-grandchildren may never know there had been a day called Thanksgiving, that it was a holiday that schools scheduled around so each family could travel across states and come together to break bread and share the ups-and-downs of the intervening year, a single day that strengthened and secured the bond that is family. So I say to each and every company that begins the Black Friday sale on Thanksgiving Day (which is never on a Friday! ): You deserve a Thanksgiving spanking for the seduction which allowed the brainwashing which turned aunts and uncles, mothers and fathers, grandmothers and grandfathers into lemmings frightened of a country-wide sell out of the year’s newest hot merchandise leading us into walking away from our families on the one day set aside each year to honor, enjoy and cherish one another. I have never participated in the mad rush of Black Friday (even when it was only a few hours on one day) and now that it begins on Thanksgiving day and lasts through the weekend I refuse to shop during that time. Spending time with my family is much more valuable to me and to my children. And just in case you’re wondering, my children have never cried on Christmas day because their dream gift was not under the tree. Spending exclusive time with my family each and every day, making sure each one of them gets one-on-one, private time with me as well as cherished time together on birthdays, Easter, Thanksgiving, any day and every day they want or need it, that is what makes a family strong. It’s not about what you possess or what is given. It’s about what you share and truly have with one another that matters and it is what creates ongoing feelings of triumph every single time you look at your child and see their successes or their loving relationships because it reinforces that you, as their parent, gave them everything they ever really needed. So be a superhero, turn off your computers, your iPhones and electrical devices (anything that comes between you and your cherished friends and family) and leads you astray from your family traditions. Pass it on! Sorry about this becoming less blog post and more a rambling rant of digressions and false starts. I appreciate your reading, but please, do turn off your computer and go enjoy Thanksgiving with your family. Next > I Love Blogging!